The microservices architectural pattern is an architectural style that is growing in popularity, given its flexibility and resilience. Together with technologies such as Kubernetes, it is getting easier to bootstrap an application using a Microservices architecture as never before. In other words, an application following a microservices architecture is composed of several independent and dynamic services that communicate with each other using a communication protocol. It is common to use HTTP (and REST), but as we’ll see, we can use other types of communication protocols such as RPC (Remote Procedure Call) over AMQP (Advanced Message Queuing Protocol). The microservices pattern can be thought as a specific case of SOA (service oriented architecture). In SOA it is common, however, to use an ESB (enterprise service bus) to manage communication between services. ESBs are usually highly sophisticated and include functionalities for complex message routing and business rules application. In microservices, it is more common to employ an alternative approach: “smart endpoints and dumb pipes,” meaning that the services themselves should contain all the business logic and complexity (high cohesion), but the connection between the services should be as simple as possible (high decoupling), meaning that a service does not necessarily need to know which other services will communicate with it. This is a separation of concerns applied at the architectural level. Another aspect of microservices is that there is no enforcement about which technologies should be used within each service. You should be able to write a service with any software stack that can communicate with the other services. Each service has its own lifecycle management as well. All of that means that in a company, it is possible to have teams work on separate services, with different technologies and even management methodologies. Each team will be concerned with business capabilities, helping build a more agile organization. Having these concepts in mind, in this article we will focus on building a proof of concept Microservices application using Python. For that, we will use Nameko, a Python microservices framework. It has RPC over AMQP built in, allowing for you to easily communicate between your services. It also has a simple interface for HTTP queries, which we’ll use in this tutorial. However, for writing Microservices that expose an HTTP endpoint, it is recommended that you use another framework, such as Flask. To call Nameko methods over RPC using Flask, you can use flask_nameko, a wrapper built just for interoperating Flask with Nameko. Let’s start by running the simplest possible example, extracted from the Nameko website, and expand it for our purposes. First, you will need Docker installed. We will use Python 3 in our examples, so make sure you have it installed as well. Then, create a python virtualenv and run $ pip install nameko. To run Nameko, we need the RabbitMQ message broker. It will be responsible for the communication between our Nameko services. Don’t worry, though, as you don’t need to install one more dependency on your machine. With Docker, we can simply download a pre-configured image, run it, and when we’re done simply stop the container. No daemons, apt-get or dnf install. Start a RabbitMQ container by running $ docker run -p 5672:5672 --hostname nameko-rabbitmq rabbitmq:3 (you might need sudo to do that). This will start a Docker container using the most recent version 3 RabbitMQ and expose it over the default port 5672. Nameko services are classes. These classes expose entry points, which are implemented as extensions. The built-in extensions include the ability to create entry points that represent RPC methods, event listeners, HTTP endpoints or timers. There are also community extensions that can be used to interact with the PostgreSQL database, Redis, etc… It is possible to write your own extensions. Let’s go ahead and run our example. If you got RabbitMQ running on the default port, simply run $ nameko run hello. It will find RabbitMQ and connect to it automatically. Then, to test our service, run $ nameko shell in another terminal. This will create an interactive shell which will connect to that same RabbitMQ instance. The great thing is, by using RPC over AMQP, Nameko implements automatic service discovery. When calling an RPC method, nameko will try to find the corresponding running service. These service classes are instantiated at the moment a call is made and destroyed after the call is completed. Therefore, they should be inherently stateless, meaning you should not try to keep any state in the object or class between calls. This implies that the services themselves must be stateless. With the assumption that all services are stateless, Nameko is able to leverage concurrency by using eventlet greenthreads. The instantiated services are called “workers,” and there can be a configured maximum number of workers running at the same time. We are using sleep from the time module, which is not async-enabled. However, when running our services using nameko run, it will automatically patch trigger yields from blocking calls such as sleep(5). It is now expected that the response time from a procedure call should take around 5 seconds. However, what will be the behavior from the following snippet, when we run it from the nameko shell? Nameko provides a non-blocking call_async method for each RPC entry point, returning a proxy reply object that can then be queried for its result. The result method, when called on the reply proxy, will be blocked until the response is returned. As expected, this example runs in just around five seconds. Each worker will be blocked waiting for the sleep call to finish, but this does not stop another worker to start. Replace this sleep call with a useful blocking I/O database call, for example, and you got an extremely fast concurrent service. Now, suppose that you were getting too many (more than 10) concurrent users calling that hello method. Some users will hang waiting more than the expected five seconds for the response. One solution was to increase the number of works by overriding the default settings using, for example, a config file. However, if your server is already on its limit with those ten workers because the called method relies on some heavy database queries, increasing the number of workers could cause the response time to increase even more. A better solution is to use Nameko Microservices capabilities. Until now, we have only used one server (your computer), running one instance of RabbitMQ, and one instance of the service. In a production environment, you will want to arbitrarily increase the number of nodes running the service that is getting too many calls. You can also build a RabbitMQ cluster if you want your message broker to be more reliable. To simulate a service scaling, we can simply open another terminal and run the service as before, using $ nameko run hello. This will start another service instance with the potential to run ten more workers. Now, try running that snippet again with range(20). It should now take five seconds again to run. When there are more than one service instances running, Nameko will round-robin the RPC requests among the available instances. Nameko is built to robustly handle those methods calls in a cluster. To test that, try running the snipped and before it finishes, go to one of the terminals running the Nameko service and press Ctrl+C twice. This would shut down the host without waiting for the workers to finish. Nameko will reallocate the calls to another available service instance. In practice, you would be using Docker to containerize your services, as we will later, and an orchestration tool such as Kubernetes to manage your nodes running the service and other dependencies, such as the message broker. If done correctly, with Kubernetes, you would effectively transform your application in a robust distributed system, immune to unexpected peaks. Also, Kubernetes allows for zero-downtime deploys. Therefore, deploying a new version of a service will not affect the availability of your system. It’s important to build services with some backward compatibility in mind, since in a production environment it can happen for several different versions of the same service to be running at the same time, especially during deployment. If you use Kubernetes, during deployment it will only kill all the old version containers when there are enough running new containers. Now we know how to effectively work with Nameko, and how scaling works. Let’s now take a step further and use more tool from the Docker ecosystem: docker-compose. This will work if you’re deploying to a single server, which is definitely not ideal since you will not leverage many of the advantages of a Microservices architecture. Again, if you want to have a more suitable infrastructure, you might use an orchestration tool such as Kubernetes to manage a distributed system of containers. So, go ahead and install docker-compose. 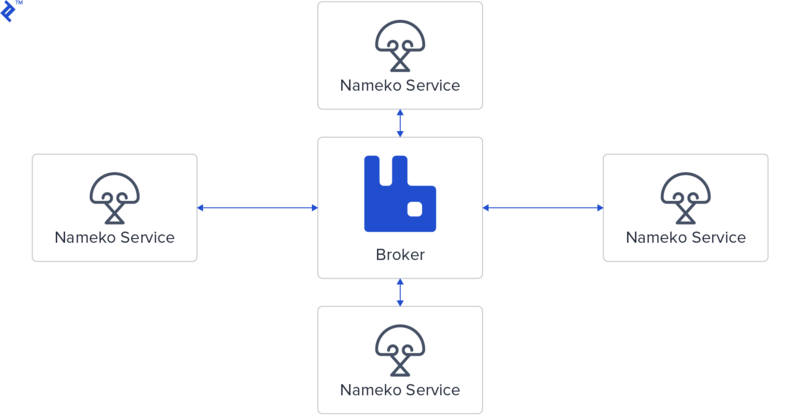 Again, all we have to do is deploy a RabbitMQ instance and Nameko will take care of the rest, given that all services can access that RabbitMQ instance. The full source code for this example is available in this GitHub repository. Ideally, each microservice would have its own database instance. However, for simplicity, I have created a single Redis database for both Trips and Airports microservices to share. The Gateway microservice will receive HTTP requests via a simple REST-like API and use RPC to communicate with Airports and Trips. Notice how we are using the nameko_redis extension. Take a look at the community extensions list. Extensions are implemented in a way that employs dependency injection. Nameko takes care of initiating the actual extension object that each worker will use. The only difference between that and the Dockerfile for the other services is the source file (in this case airports.py), which should be changed accordingly. echo "$(date) - waiting for rabbitmq..."
echo "$(date) - waiting for redis..."
We have seen how Nameko works by creating a local running instance of RabbitMQ, connecting to it and performing several tests. Then, we applied the gained knowledge to create a simple system using a Microservices architecture. Despite being extremely simple, our system is very close to what a production-ready deployment would look like. You would preferably use another framework to handle HTTP requests such as Falcon or Flask. Both are great options and can easily be used to create other HTTP-based microservices, in case you want to break your Gateway service, for example. Flask has the advantage of already having a plugin to interact with Nameko, but you can use nameko-proxy directly from any framework. Nameko is also very easy to test. We haven’t covered testing here for simplicity, but do check out Nameko’s testing documentation. With all the moving parts inside a microservices architecture, you want to ensure you’ve got a robust logging system. To build one, see Python Logging: An In-Depth Tutorial by fellow Toptaler and Python Developer: Son Nguyen Kim. What language is RabbitMQ written in? RabbitMQ is written in Erlang. RabbitMQ is a message broker used to handle communication between systems in distributed computing. Is AMQP TCP or UDP? AMQP usually uses TCP, as it is commonly expected to be reliable. Specifically, RabbitMQ is configured to use TCP by default. Microservices is an architectural pattern that focuses on creating relatively small and uncoupled services to compose an application, rather than a so-called monolith. Docker is a tool for deploying isolated, or containerized, applications. Docker containers are similar to virtual machines in a sense, but much more lightweight both in size and resource consumption. What is the use of Docker? Docker is used to clearly define the how to install all prerequisites for an application and how it should run, allowing for easy testing and environment replication. A microservice is a self-contained building block for a larger application, which usually runs on the web. It is self-contained in the sense that it ships with its own prerequisites and does not depend on other microservices to be deployed and run. Great article! I am looking forward to seeing another one about microservices in Python. I enjoyed reading this, very informative, but i cannot still wrap my head around how a framework like Flask would work with this, how you can interchange the two technologies. One more thing, when you declared your Trips Service class, the class name is wrong, i'm thinking you meant `TripsService` and not `AirportService`. Thanks for the correction! So, Flask is a great framework for building microservices. The idea is that basically you would replace the GatewayService with a Flask application. Just remember: microservices must be stateless, so that they can be replicated easily. If you build them following REST principles chances are you will be fine. Okay i get, i also have a question then. You spoke about nameko being able to spawn new instances and have like a load balancer inbuilt, but if you aren't building the whole app with nameko, then how would the Flask gateway scale? It'd definitely still face the limitations of Flask, but then the nameko services would scale but might be idle most times as the load would then be on the Flask app and it's concurrent limitations would still slow down the app as a whole. Hi, Great article! very well written Guilherme (y) I have a question: will these worker be created each time i call an rpc, for example, if i have a heavy AI model that needs to be loaded into memory for prediction purposes, in that case, what is the right way to go? thanks for the response. i am thrilled. Yes the AI models are totally thread safe. they are just learned weights that require no change once they are trained. however they need to be loaded into memory before they can perform a prediction( dot product with the input, a forward pass). i have looked into dependency providers but can't seem to get my head around them due to the scarce documentation available on them. My only concern is the life span of a injected dependency. Will the dependency provider inject the same model to each worker service when created by an rpc? if thats the case then i can work with them as it is or,if its is not the case i would probably need to create a separate model server and expose it some how rest/rpc and make it available through the dependency provider. In this case I believe it should be fine to initialize the model on a setup method in the dependency provider. The setup method should be called automatically before the service container starts. Then, simply return the model on the get_dependency method. Run some tests to see if that works! Thanks for sharing this article. It it ok as a toy example on how to do simple, non-productiony things, and gaining insights into general concepts. But it suffers all the same issues as the book "Microservices In Action" by Manning (which also illustrates concepts with nameko) in so far as nothing is close to realistic for real-world (production) business problems. Using something like nameko just makes me want to use Erlang/Elixir which has that kind of support out of the box (sidenote: rabbitmq runs on erlang). Get the sense python is the wrong choice for this type of use case as described (aws lambda and evented architecture would have time and place), and nameko in particular. Again, thanks for sharing & I took the time to clone the repo and try out the sample. Be interested to hear your thoughts. Especially any real-world commercial experience with nameko etc and any retrospective info. Guilherme is a computer engineer who has a passion for solving challenges and building beautiful software. He is a flexible and dynamic developer who has been able to learn new technologies and start building idiomatic code very quickly. He is enthusiastic about elegant solutions and sharing ideas with other people.